AppMetrica Unity is a plugin for the Unity3d game platform that includes support for the AppMetrica SDK version 3.0.0 and later for Android and iOS. Step 1. Download the plugin. Step 2. Add the plugin to the project. 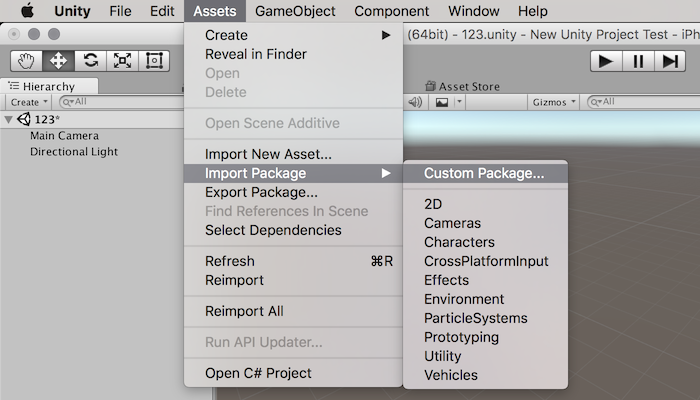 Open the project in Unity Editor and import the plugin AppMetrica.unitypackage (Assets → Import Package → Custom Package). Step 3. Open the Assets/AppMetrica folder and drag the prefab AppMetrica to the project's main stage. If the plugin is integrated this way, the AppMetrica script on the added prefab automatically initializes the AppMetrica SDK and configures tracking of sessions and errors. The added AppMetrica prefab is a singleton. 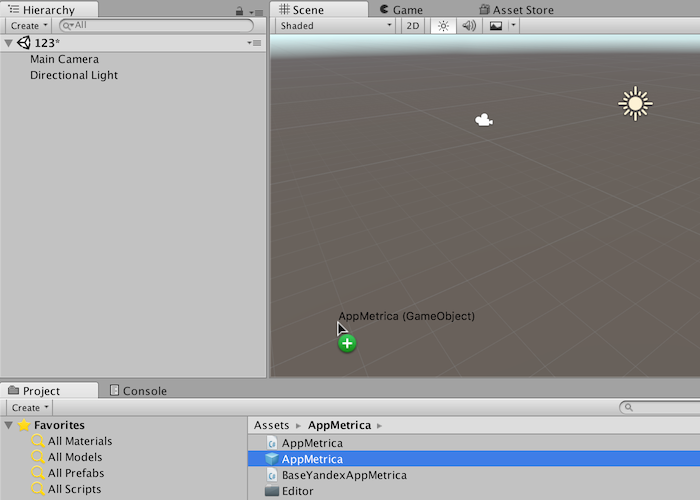 It isn't deleted when switching to a new Unity stage, and it deletes other objects that the AppMetrica script is installed on. API key — The unique application identifier that is issued in the AppMetrica web interface during app registration. Exceptions Reporting — Enable or disable sending errors. Session Timeout Sec — The timeout for ending the session if the app is inactive. Location Tracking — Enable or disable transmitting location data. Logs — Enable or disable logging the library's activity. Handle First Activation As Update — Enable or disable the ability to confirm that the first launch of an app with the AppMetrica Plugin is an app update, and not an install. StatisticsSending — Enable or disable sending statistics. Note. The AppMetrica/ExampleUI directory has examples of using AppMetrica in apps. To launch the iOS version in Unity 4, you need to copy the file Other/Unity.iOS.Extensions.Xcode.dll to the directory Assets/AppMetrica/Editor. 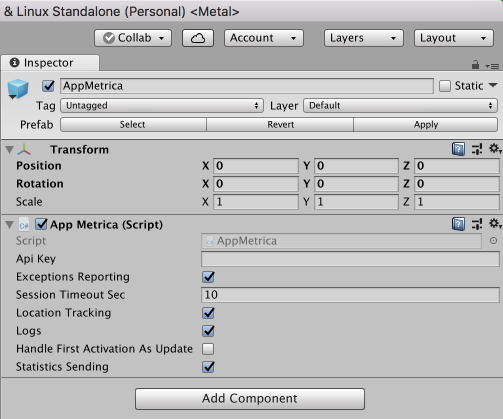 If you don't want to collect device location data, go to the Unity 3d interface (Settings → Other Settings → Scripting Define Symbols) and add the APP_METRICA_TRACK_LOCATION_DISABLED directive. If you want to collect device location data, add the following permission to the AndroidManifest.xml file: android.permission.ACCESS_COARSE_LOCATION. In the code, use AppMetrica.Instance for accessing AppMetrica. Information about techniques and integration AppMetrica in the application, see the documentation for Android and iOS.